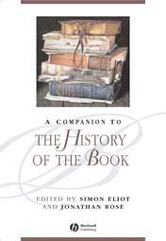 From the early Sumerian clay tablet through to the emergence of the electronic text, this Companion provides a continuous and coherent account of the history of the book. Makes use of illustrative examples and case studies of well-known texts. Written by a group of expert contributors. Covers topical debates, such as the nature of censorship and the future of the book.